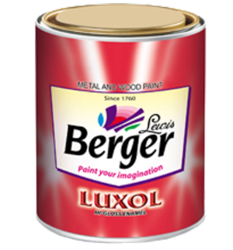 Leading Retailer of berger luxolwood varnish from Noida. Luxol High Gloss Enamel offers a mirror like gloss which can be used both for exterior and interior surfaces mainly on mild steel, wooden and suitably prepared masonry surfaces. Formulated with alkyd and select colourants, it gives a long lasting glossy finish to every surface it touches.